The size and broad mission of today’s First Baptist Church of Jackson, Mississippi contrasts with the period of adversity in which a tiny group of seven people organized the congregation in May 1838. Now the Church represents the fruition of faith that characterized its founders as they nurtured it through years of struggle. The Church was established during the Depression of 1837-40, its membership striving to survive as Jackson, then a 16-year old village of fewer than 600 people, was laboring to become the permanent seat of state government. Exemplifying the spirit and determination of the original congregation in those times of hardship was its endeavor over six years to erect a building. Apparently, the worshipers met in private homes during that interval, the organizational meeting having been in the residence of Maj. and Mrs. George B. Work. The first pastor of the pioneer church was the Rev. L. B. Holloway, one of the leading clergymen of the area. The Rev. Holloway resigned in 1843; but he and his wife, the latter having played a leading role in raising funds for the first building, continued to be active in the Church for decades thereafter. Assisted by Baptists from across the state, the infant congregation began construction of the building in 1843, and it was completed in 1844, by which time its membership had grown to 54 people. The first service in the building, sadly was the funeral of its second pastor, the Rev. John W. Buie, who spent his entire time as pastor traveling through the State soliciting funds for the church building. The original structure still stands at the corner of North West and Yazoo streets, facing Smith Park. A wave of substantial growth was recorded from 1844 to 1860 as Indian cession treaties opened large areas of land to the settlement. The city began to reap the full benefits of being the State Capital, and on the eve of the Civil War the membership had reached 331. During those 16 years, the church was served by five pastors. The Rev. William H. Taylor succeeded Rev. Buie and served from 1845 to 1847. Then came pastors S. I. Caldwell (1847-48), J. B. Stiteler (1849-51), D. E. Burns (1852-54) and L. H. Milliken (1856-60). The Church faced dark days from 1853-55, when yellow fever swept the land, depleting the congregation. Scarcely had the church recovered from that disaster when it had to endure the devastation of the Civil War. Confederate authorities took possession of the basement of the church for a hospital in 1863. Later that year, the city of Jackson was captured by Union forces and subsequently occupied by Federal troops on three occasions. The Union Army also used the Church as a hospital. Although the building was battered to a state of ruin by the end of the war, members consoled themselves with the thought that had the church not been used as a hospital, it would probably have been destroyed. Led by W. H. Anderson as pastor, church members were able to do little during the latter part of the war except care for the sick and the wounded and to try to maintain, through sporadic services, the semblance of an organization. However, the congregation recovered during the next three decades to undertake its second building program. It was served during those years by pastors J. A. Hackett (1868), W. H. Leavell (1873), J. T. Zealy (1875) and H. F. Sproles (1880). It was the far-sighted Sproles who, with the support of Baptists in Jackson and, again, Baptists from across the State, directed the gathering of funds to buy a new site and to build a more spacious structure. 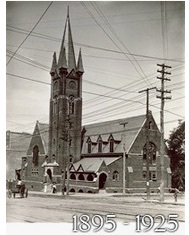 The new edifice, built on the corner of Capitol and President Streets, was occupied in 1894, and for more than 30 years served the congregation well. Dr. W. F. Yarborough became pastor in 1899; the Rev. W. A. Borum, in 1910; and Dr. W. A. Hewitt, in 1917. Hewitt, less than two years after his arrival, started talking about a “new church house,” and the committees were put to work on the plans. Construction began in April 1924, at North President and College streets, still the site. The first service in the new building was conducted October 5, 1926, in the Sunday School Auditorium on the basement floor. 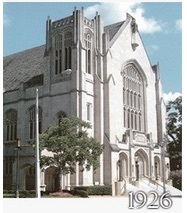 The first service in the new sanctuary was June 26, 1927. Dr. Hewitt served as pastor for 28 years, longer than any other, and during those years membership grew from 800 to 4,500. Remarkable growth in membership and physical facilities continue. Continued progress has come under the pastorates of Dr. W. Douglas Hudgins (1946-1969); Dr. Larry G. Rohrman (1969-73); Dr. Franklin D. Pollard (1974-1980); the Rev. Earl Craig (1981-1985); Dr. Pollard again (1986–2001), making him the church’s 17th and 19th pastor; Dr. Stan Buckley (2004-2011); Pastor Mark D. Smith (2013-2015); and Dr. Matt W. Brooks (2016-2017). This congregation purchased the old First Christian Church property at North President and Mississippi streets in 1946, but possession was not taken until 1950. Two years later ground was broken for a new educational building and chapel that would take three years to complete at a cost of about $1.3 million. Another milepost came in 1955 when the morning worship service was first televised. Since that time, the Church has purchased its own color cameras and technical equipment. The morning Worship service and other special services have been broadcast by local TV stations as well as world-wide via satellite, national networks and via the Internet. Several remodeling projects were carried out during the early 1970’s, including the sanctuary choir, organ and piano areas and the addition of an updated sound system. In 1976 the former Y.M.C.A. building on the corner of State and High streets was purchased by the Church for a Family Life Center. The $22.5 million building expansion and renovation program, completed in 1989, more than doubled the size of the structure, accommodating all programs with room for future growth. The sanctuary contains seating for 3,261, including 286 in the choir. Prior to this, the sanctuary would accommodate 1,350. The expansion added a multi-floor center atrium, tying all portions of the building together. The five floor building fills an entire downtown city block, containing approximately 400,000 square feet. The congregation, through the building fund and the church budget, contributed more than $12 million toward the cost of the expansion and renovation program, and the balance was borrowed. Recognizing the importance of continually reaching people for Christ wherever they are, over 35 churches have been launched through the prayers, financial support and labor of the members of First Baptist Jackson. Missions mobilization occurs locally, nationally and internationally. In addition to serving our local city and state, First Baptist regularly sends teams throughout North and South America, Europe, Africa and Asia. Though the size of the congregation and the dimensions of the physical plant are substantial, members take joy in the emphasis on evangelism and stewardship. As the church has grown, we have continued to rely on the Lord to help us meet each need. Each year the church participates in a number of Southern Baptist programs that directly support denominational and mission activities. A fixed portion of the annual giving each year is designated for the Southern Baptist Cooperative Program. In addition to Cooperative Program support, over $800,000 is given annually to support international, North American, and local mission causes. In 2000, the church began a $22 million building and renovation program called Vision for Life. This ambitious building program provided a new Christian Life Center that houses the church’s recreation, counseling and student ministries. It also included renovations to the existing church plant and the construction of the Mission First ministry center in the West Park neighborhood of inner-city Jackson. Through the years, the congregation has been blessed with staff that love the people as much as they love the Lord. Through the ministry of these individuals and their families, God has blessed First Baptist. A culture of excellence and service for the Lord has flourished, as each has impacted the life of this church. Untold numbers through the years have grown in their ministry and been planted in additional places of influence throughout the Southern Baptist Convention and beyond. The character of First Baptist has developed through years of foresight, careful planning, sacrificial commitment, splendid leadership, and unparalleled giving. That character could perhaps be described as that of a determined focus on the growth and development of the individual Christian. These are Christians who assume their responsibility in seeing that God’s message is proclaimed and faith is passed on from generation to generation. Perhaps only because of those unknown figures of the past can the present congregation assume the posture of a people of broad mission and exceptional vision . 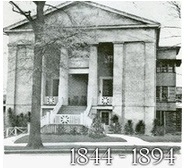 . . the heritage of The First Baptist Church. 1863 Confederate forces take control of church for use as hospital. Union forces later use the building for a hospital as well. 1894 A new building, on the corner of Capitol and President Streets, was occupied, and for more than 30 years served the congregation well. 1924 Construction begins in April at North President and College streets for a new campus site. 1926 The first service in the new building was conducted on October 5, in the Sunday School Auditorium on the basement floor. 1927 The first service in the new sanctuary was June 26. 1917-1945 Membership grew from 800 to 4,500. The annual budget increased from $10,000 to $110,000. 1946 Old First Christian Church property at North President and Mississippi streets purchased. 1952 Ground broken for educational building and chapel that would take three years to complete at a cost of about $1.3 million. 1955 Morning worship service first televised. Early 1970’s Remodeling of sanctuary choir, organ and piano areas and the addition of an updated sound system. 1972 Second Sunday Morning Worship service begins. 1975 Second Sunday School hour added. 1976 The former Y.M.C.A. Building on the corner of State and High streets converted to a Family Life Center. 1977 Third Sunday School hour added. 1982 Third Worship Service begins. 1989 $22.5 million building expansion and renovation program more than doubles the size of the structure. 1990 Expansion allows return to two Sunday Morning worship services. 1999 Vision for Life campaign begins to build new Christian Life Center, to organize and develop Mission First for community ministry, and to renovate educational space and to refurbish the organ. 2006 Established Madison Campus near the Gluckstadt community. 2010 Planted a new church called Grace City Church in northeast Jackson. 2010 Established a formal partnership with CityChurch, an inner-city church in Jackson. 2010 Launched the Haiti Project, to build a sustainable community in earthquake-ravaged Haiti. 2013 Congregation celebrates 175 years and looks to the future. 2015 Madison Campus is launched as a stand-alone church with the name “Grace Crossing Baptist Church”.